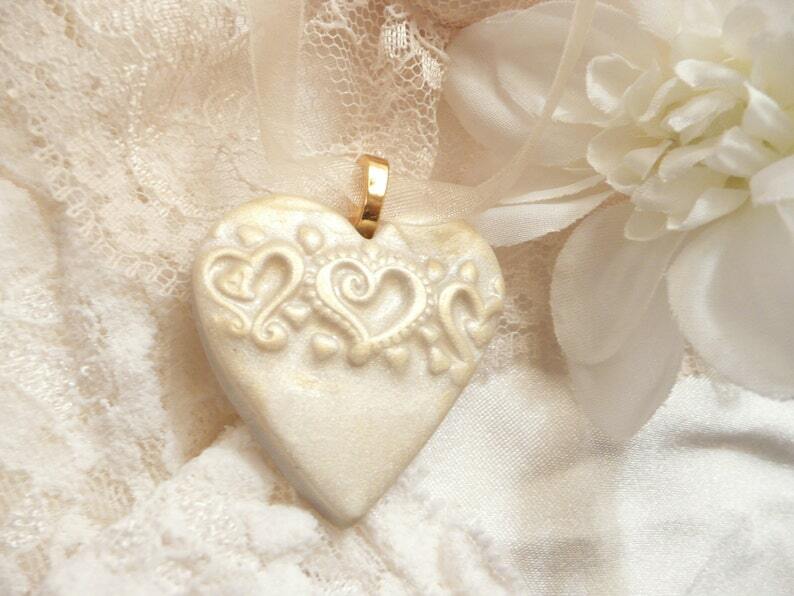 This ivory heart pendant is handmade of polymer clay, with a raised hearts design, lightly highlighted with gold metallic powder, and sealed with acrylic varnish. Finished with a large gold-plated Aanraku bail. Measures about 1 1/2" wide x 1 7/8" tall (3.8 x 4.7 cm). :: A beautiful unique design to wear as a necklace for the wedding. :: Or use as a lovely bouquet charm for the bride's / bridesmaids' bouquets. Select "add a ribbon" and I will include a pretty sheer ribbon for attaching to the bouquet(s), and hanging as a keepsake ornament after the special day. CUSTOM ORDERS ARE WELCOME. Would you like a different color? Please ask. "The bouquet charms were just delivered. They are so beautiful and I couldn't be happier. Just took photos of them and emailed them to my bridesmaids, who think they are gorgeous too."